When Amrita Rao came for a Rediff Chat on November 22, many of the readers had a similar worry -- that she would plan her own vivah, and quit the movies. The actress has a strong fan base, who just don't want her quitting just yet. Amrita talked about herself, her favourite actors, one of them being Aamir Khan -- surprisingly, not her Main Hoon Naa costar Shah Rukh Khan -- and much more. For those who missed the chat, here's the transcript. Amrita Rao says, Hi, you are with me Amrita Rao. Let's rock. gokul asked, Hi Amrita. Personally, I didn't like you much before VIVAH. But when I saw VIVAH, I was spellbound. It was a fantastic performance for sure. The penultimate reels were amazingly acted, narrated and executed. I fell in love with your characterization..! You reminded me of the innocence what Jaya Bhaduri in her hay days used to have. Overall, brilliant performance in a brilliant movie. Cheers..! Amrita Rao answers, Hey Gokul, so good to know that you changed your opinion about me after Vivah. Guess thats what Soorajji does to all his heroines. Love always. Muneeb asked, Hi, Amrita.Congratulations for your brilliant performance in VIVAH and also for the success of the movie. Can you tell me that who has been your all time favourite film star and secondly what are your forthcoming films? Amrita Rao answers, Aamir Khan. Forthcoming movies are yet in meeting stages. Amrita Rao answers, Hi Prachi, Thank you so much. Hope we do good movies in future and keep up to your expectations. Love. Amrita Rao answers, Promise you will never spoil the good Indian girl image. Thanks. Amrita Rao answers, Hi Pradeep, Yes I am a South Indian from South Karnataka. Would love to do Tamil films one day. Amrita Rao answers, Hi, great to hear from you. A big hello to your brother. My favourite actor is Aamir Khan and Govinda. Lots of Love. rajesh asked, what was your family's reaction when u expressed your desire to act in movies? Amrita Rao answers, Rajesh, my family supported me and thats why I am here today. Love. Amrita Rao answers, Hi, thanks so much. Will sure and try and catch that website. Thanks for letting me know. mahesh Pandit asked, I am Mahesh Pandit. You know what is i am? dimpy asked, Do you belive in Love marrige or Arrange marrige? Would you mind to tell me when is your Birth Day? Who is your Favorit Actor & Actress? Do you like Poonam by nature or different? o asked, plz add some pounds........ u look georgeous. bob asked, mansoorali, whats her mail id? Randy asked, Hi Amrita, I was wondering if you like to work with Salman Khan and Aamir Khan in a film? Amrita Rao answers, Hi Randy, both Aamir and Salman are my favourite and I can watch Andaz Apna Apna 100 times. Would love to work with them. Krishna asked, Hi Amrita! I was wondering if you had one chance to do a remake, which film will it be and why? Amrita Rao answers, Hi Krishna, maybe 'Sound of Music' because I grew up watching it. gauthamkumarks asked, Why did you choose to act in VIVAAH? navred asked, Hi Amrita, I feel u r the only actress who can fill in the gap created by Madhuri dixit. And you seem to be making your moves so. I could see madhuri in your performance in vivah. One sincere request..do only movies that showcast yours performance n beauty. shetty asked, hi amrita,dont u miss mangalore? Amrita Rao answers, Hey Shetty, have been born in Mumbai, but yes Mangalore is beautiful. sagar asked, Hiii amrita...first of all,u are lookin beautiful in Vivah....i wanted to ask u tht y are actress of des days not doing roles like u hav done in Vivah?? ?Do u think that ther are not enough good directors like soooraj ji to make such a film??? thanveer_ah asked, oh amruta i am a great fan of urs. u know, i am searching for a girl who is ur look alike as i am sure i won't b able to marry u. do u know anyone???????? Mukul asked, Hi Poonam aka Amrita, This is Mukul from Boston, US. I watched your recent movie Vivah. I liked your work in the movie. One more thing, My girl friend name is also Poonam. The only difference is...this time, I am from Mathura and she is from Delhi. All the best !!! Rajanish asked, Hi Amrita is it true that you are quitting movies. Sharath asked, Hi Amrita, Well I heard u r getting married.....We haven't seen the real Amrita yet...and u r leaving Bollywood so fast. Now don't say u r going to act after marriage...if u r married...we can't c u in that angle...I mean now u r almost a dream gal sort of an actress...so after marriage how can anybody imagine u as a dream gal...I just(2 days back) expressed to one of my friends that I like you in present bollywood actresses. Well I know I can't stop anything....Anyways I can wish u good luck. So, Good luck Amrita....phulo phalo jug jug jeo.....;-) Sharath - 'The hyderabadi'. LegendOfAmritaRao asked, Amrita is one of the most promising newcomers. She's talented and very sweet. I don't think saying there's a possibility she may fill the void left by MAdhuri is a ridiculous remark..It IS possible...Esp. After Vivah. 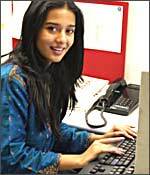 Amrita Rao answers, Hey Punam, wish could show you my self right now and know Rediff people are too professional to make uloos, so chill its me Amrita. Nikhil asked, Hi Amrita,How u doing? This is Nikhil here from city of mumbai...!! Only one thing to tell, u please dont quit bollywood........!! No more words as u r already rocking...keep Smiing...God bless u....!! lovekesh asked, Helo Amrita. Do you marry me. Amrita Rao answers, Hey Mathew, I guess i have been inspired by all the films that I grew up watching. Amrita Rao answers, Hi Sumit, that was so observant of you. Yes the tug of war sequence was very cute and it was fun shooting for it. Andrew asked, I feel Priyanka Chopra, Vidya Balan, Bipasha Basu, and you to be the future of Bollywood, what do you say? keshav asked, hi. vivah addressed a social cause which is relevant today. gud acting amrita. Priti asked, Hi Amrita, I mate u at the set of Pyare Mohan in Borivali, I really wants to talk to u on that time, but I did not get this chance, but I'm rally lucky that I've got chance to talk to u now. How is everything going on? Maulik asked, AMRITA...This Maulik from UK, I am a researcher in computing mostly dealing with Multimedia productions and distributions. Frist of all congratulations for your success, i liked you personally in ishq vishk and Main hoon na mainly. I want to know as an artist what do you think you want to imporve at? Archana asked, Hi Amrita, Vivah movie was so touching...i started crying...its about daughters & i'm right now away(Canada)from my parents & my daughter. U have done a great job in the movie & i told all my friends here to watch the movie. Gud Luck for ur Future projects!! FAHEEM~PAKISTAN asked, helloo..... amrita! how r u?..... first of all, i want to congrats U on BRILLIANT success OF VIVAAH. i want to say that i'm just THE CRAZIEST FAN! i WILL do anything to meet u! plz, do come pakistan. i want to meet u. i just want a single autograph of yours. AND ONE MORE THING I'VE WRITTEN SOME POEMS ON YOU. I'LL DEFINATELY SEND IT TO UR HOME ADDRESS OR IN UR FANMAIL ADDRESS. LOVE U SOOOOO MUCH. TAKE GOOD CARE OF UR SELF! BYE. ReaB asked, I think your role as Poonam in Vivah was your best till date! What do you think? Amrita Rao says, hey everyone I am so happy I could interact with some of you live on chat!..pathetically sorry I couldnt reply to each & everyone..will have to say bye now!! do watch vivah for me. I'll be very happy. its also on broadband at www.rajshrifilms.com....Keep in touch at www.amrita-rao.com. Bye.